ELKHART LAKE, WISCONSIN (November 9, 2017) — LevelUp Racing School is excited to announce that their next 2Day Racing School will be held at Atlanta Motorsports Park in Dawsonville, GA, on December 18 and 19. 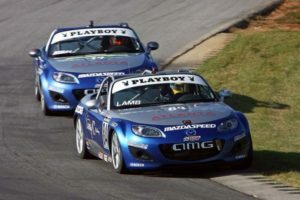 Atlanta Speedwerks will provide Mazda MX-5 racecars and at-track support for the event. The school is meant for anyone who wants to improve their racing skills. For those who are interested in going racing with the Sports Car Club of America, this SCCA Accredited Two Day Racing School will have additional staff on site who have been racing with SCCA for many years in Mazda Spec Miata, Mazda MX-5 Cup cars and other classes. They have years of experience navigating the sometimes confusing and intimidating process and flow of an SCCA weekend from registration to spraying the champagne. They can help students choose a class of car to drive, whether to buy or lease a racecar, the best way to move a racing career forward, and answer any other questions regarding racing with SCCA or other sanctioning bodies. Upon successful completion of the intense the two-day program, graduates may apply for their SCCA Novice Permit with the Drivers School requirement waived, and are on their way to an SCCA Full Competition License, which is honored worldwide. The cost of the school is $3450. For those who have always dreamed of being a racecar driver, want to become a better racecar driver, want to be a better track-day driver, or learn how to heel-and-toe, double-clutch downshift, it all starts with some of the industry’s best instructors at LevelUp Racing School. Atlanta Speedwerks is a full-service race shop based strategically between Road Atlanta and Atlanta Motorsports Park. Owner Todd Lamb is a professional racer, driver coach, and successful entrepreneur who has advanced to the top of the Mazda Development Ladder. Atlanta Speedwerks encompasses a wide range of experience including MX-5 Cup, Spec Miata, Spec Boxster, Conti GS/ST, World Challenge, and many forms of endurance racing. The shop installs roll cages, provides full prep and trackside support services, and builds turn-key racecars. Atlanta Motorsports Park’s main road circuit is a two-mile long road course that was designed by Formula One track architect Herman Tilke. The track consists of 16 turns and 98 feet of elevation changes throughout the course. Two famous corners have also been incorporated into the track: Spa-Francorchamp’s corner of Eau Rouge and the famous Carousel corner from Germany’s Nürburgring track. AMP is the first green, sustainable motorsports club of its kind, for high performance cars, motorcycles and karts. In addition to providing a driver’s haven for its members, Atlanta Motorsports Park offers private track rentals, corporate group options as well as the world’s most unique kart track. For more information, visit www.LevelUpRacingSchool.com or call 920-838-6612. 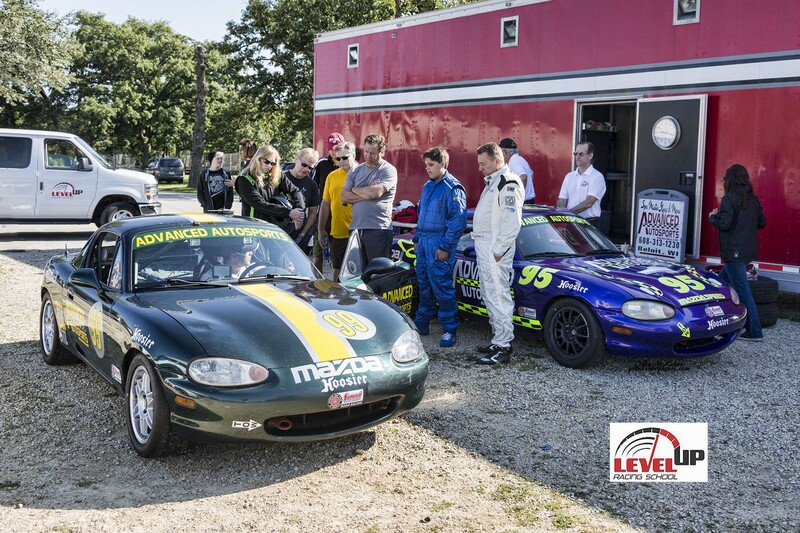 ELKHART LAKE, WISCONSIN (August 23, 2017) — LevelUp Racing School is excited to announce that their next two-day racing school will be held at the famed Road America in Elkhart Lake, WI, on October 3 and 4. This highly-anticipated event will be the second stop for the LevelUp Racing School. This two-day school will be adding data-logging and analysis to its robust curriculum. Students will be introduced to data acquisition, which can help them graphically visualize their performance compared to an instructor’s baseline reference lap. “We are excited to welcome LevelUp Racing School to our facility. It is great to see a new racing school with such deep instructor experience showcase its curriculum on our 4-mile, 14 Turn, legendary track,” said John Ewert, Communications Director of Road America. 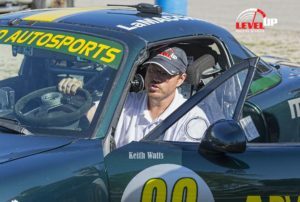 LevelUp is delighted to announce that veteran motorsport professional, Terry Earwood, will be making his debut at Road America. 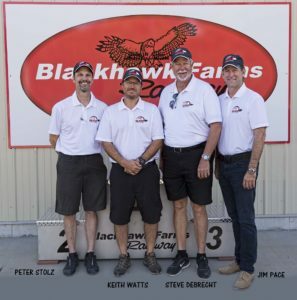 Earwood has been instructing racing schools at Road America since 1984 and he has taught more than 30,000 students over the course of his career. About Road America: Established in 1955, Road America is located midway between Milwaukee and Green Bay in Elkhart Lake, Wisconsin. The world’s best racers have competed at this legendary four-mile, 14-turn road circuit for over 60 years. The 640-acre, park-like grounds offer amazing viewing opportunities, fantastic concessions and high-speed excitement to hundreds of thousands of spectators each year. In addition to public race weekends, Road America offers a variety of group event programs, the CTECH Manufacturing Motorplex for karting and supermoto, and the Road America Motorcycle and Advanced Driving Schools. For more information, visit www.roadamerica.com Follow Road America on Facebook at www.facebook.com/RoadAmerica and on Twitter: @roadamerica or call 800-365-7223. 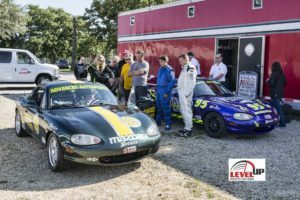 ELKHART LAKE, WISCONSIN (July 19, 2017) — LevelUp Racing School is adding a Data Lapping Day to its curriculum, offering students a unique opportunity to test like the pros. 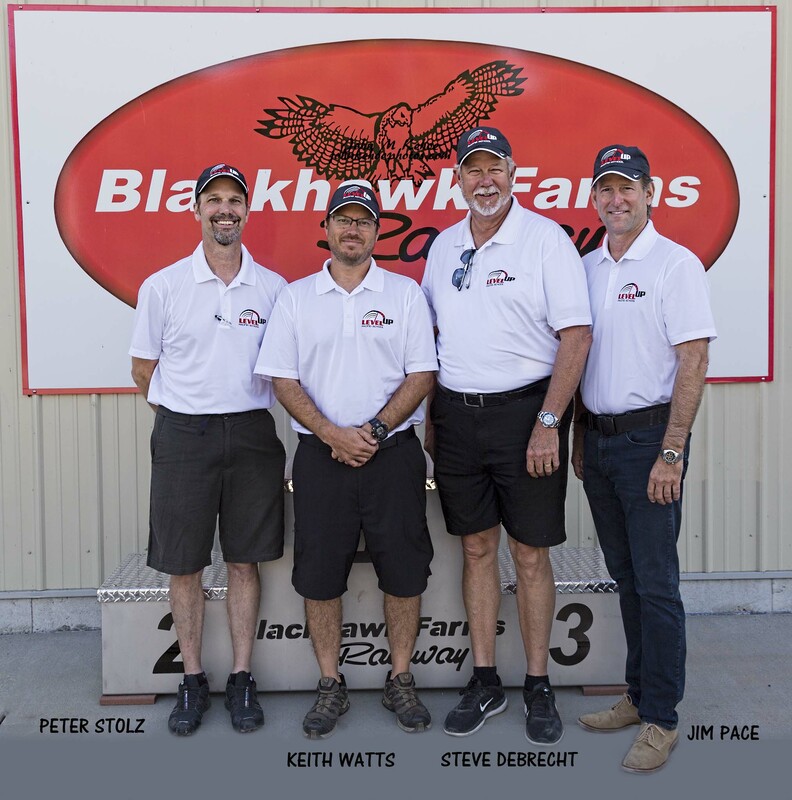 The first Data Lapping Day will be held August 10 at Blackhawk Farms Raceway in South Beloit, Illinois, immediately following the Two-Day Racing School. The August 10 Data Lapping day will offer students more than two hours of track time and access to sophisticated AIM vehicle data and coaching by school staff. Drivers will enjoy four, 30-minute on-track sessions in a professionally prepared Spec Miata race car, followed by feedback sessions to analyze performance and interpret data from on-board systems. The Data Lapping day is designed to provide students with invaluable skills that will help them get the most out of their track time, and mimics the experience of a professional driver at a pre-race test. A two-to-one student-teacher ratio ensures ample individual attention and personal feedback. Drivers wishing to accelerate their development may also choose to purchase a one-on-one Lead/Follow session with a veteran instructor. These private sessions allow instructors to evaluate many aspects of performance in real time and deliver quick results: many people shave seconds off of their best time with the help of just one of these sessions. Pricing is just $1,850 for the August 10 Data Lapping Day, and participants from the Two-Day school get a $100 discount. Lead/follow sessions are $1,250 each. Space is limited. Among the newest instructors to join LevelUp Racing School is Terry Earwood. 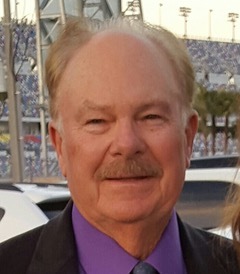 Earwood is a veteran motorsport professional who started instructing in the 1970s and has taught more than 30,000 students over the course of his career. He was the Chief Instructor for Skip Barber Racing School from 1984 until 2017. LevelUp Racing School is introducing their inaugural race school event, to be held at Blackhawk Farms Raceway, located in South Beloit, Illinois. “It’s exciting to be part of a team effort with good friends that I’ve known and worked with for decades. Instructors Jim Pace, Steve DeBrecht and I go back to the early 90’s, and I have such great respect for their backgrounds as drivers and their ability to communicate effectively. We all have a great rapport and that translates to a great learning experience for our customers.” said Peter Stolz, Owner and Founder of LevelUp Racing School. Learned skills include, but not limited to: The Racing Line, Trail Braking, Passing techniques, and more!